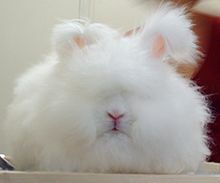 The Angora rabbit is the fluffiest living being on our earth. It is named after the city of Ankara the capital of Turkey. It has so thick a growth of hair that its face is barely visible. From a distance it seems like a big ball of cotton. Because of its heavy weight of fur it has difficulty in walking. It is found in Turkey and is the oldest of pets. The French royalty loved this pet and domesticated it from the 18th century. It was brought to the USA in 20th century. Its fur is used for making the fur – coats. The fleece taken from an Angora goat is called Mohair. A single goat produces between four and five kilograms of hair per year. Angoras are fleeced twice a year, unlike sheep, which are fleeced only once. Turkey, the United States, and South Africa are the top producers of mohair. 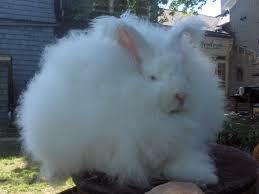 For a long time, Angora goats were bred for their white coats. 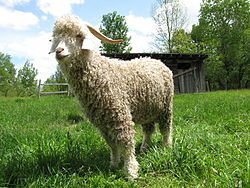 In 1998, the Colored Angora Goat Breeders Association was set up to promote breeding of colored Angoras. Now, Angora goats produce white, black (deep black to grey and silver), red (the color fades significantly as the goat gets older), and brownish fibers. Angora goats are more susceptible to external parasites (ectoparasites) than similar animals, as their coats are denser. They are not prolific breeders, nor are they considered very hardy, being particularly delicate during the first few days of life. Further, Angoras have high nutritional requirements due to their rapid hair growth. A poor-quality diet will curtail mohair development. Turkish Angora cats have a silky tail, medium-long length coat, no undercoat and a balanced body type. Though known for a shimmery white coat, Turkish angora cats can have one of more than twenty colors including black, “blue,” and reddish fur. They come in tabby and tabby-white, along with smoke varieties, and are in every color other than those that indicate hybridization (cross breeding), such as pointed, chocolate, lavender, and cinnamon. Busy bee Jean Bishop hits £100k target at Pride of Britain . HULL’S bee lady has smashed her £100,000 target after being named Britain’s Fundraiser of the…. She has celebrated her 91st birthday – has been raising funds for the last 14 years. All the funds have been raised while she dresses up like a honey bee. The message is clear: drop by drop makes a ocean.